A monster's tale . . .
We make our statement through this artwork. Here is what this poster tells. It tells about war criminal Salauddin Quader Chowdhury’s crimes during the Liberation War of Bangladesh in 1971. It tells about the genocide and crimes against humanity that he perpetrated, about the criminal charges for which he was tried, convicted and sentenced by the International Crimes Tribunal and the Supreme Court of Bangladesh. Most importantly, this poster also names the victims, witnesses, and places. It tells all. This is a day of reckoning for which a nation waited for 44 long years. Heinous war criminal Salauddin Quader Chowdhury’s guilty verdict and sentence for highest punishment has been upheld by the Appellate Division of Bangladesh Supreme Court. 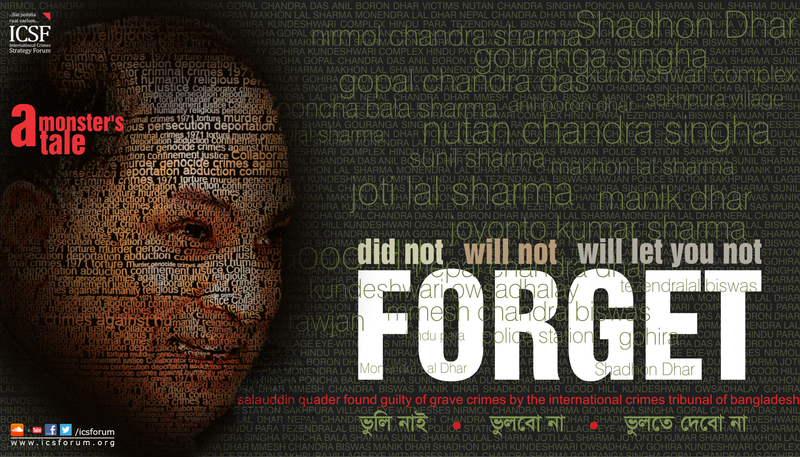 Previously, on 1 October 2013, the accused was found guilty beyond all reasonable doubt and was sentenced to death by the International Crimes Tribunal of Bangladesh on four counts due to his involvement in genocide and murder as crimes against humanity.